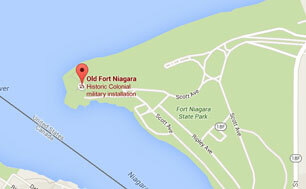 Old Fort Niagara offers a wide range of volunteer opportunities to appeal to a variety of interests and abilities. We have a minimal time commitment requirement of eight hours per year. We would like to see you at least once in a calendar year to be continued on our mailing list. Whether it's several hours a week or several hours a year, we can use you. And not just in the summer. We have needs all year around. We will keep you apprised of the opportunities to help through a monthly newsletter called the Garrison Orders. In it appears all of the up-coming events that need volunteer support, and many longer-term projects and programs that could use your help. Volunteer benefits include free admission to the fort and its programs for yourself, and discounted admission for your family and guests, as well as admission to special "members only" functions. You would also qualify for discounts on Museum shop merchandise and OFN publications, while receiving a subscription to a volunteer newsletter that gives advanced notice of special fort programs. Last, but certainly not least, you will get the satisfaction of helping Old Fort Niagara's history come alive for our visitors for years to come! Fundraising: Help plan and conduct the site's annual fund campaign. Field Musick: Play a fife or drum in the Fort's regimental field music.